He was given two years to live in 1963. A decade later, he published the theory that would first get his name onto a scientific phenomenon. It identified Hawking Radiation, the energy emitted by black holes as they spin, eventually leading to their “evaporation,” or disappearance from the universe entirely. But he didn’t stop there. Even as his motor neurons rebelled against him, he dedicated his life to discovering the forces that governed their existence. His body, unable to follow his mind’s commands, became increasingly contained; even as his ideas and theorems became less so. As his body was reduced to controlling a voice-synthesis computer with a cheek muscle, his mind was focused on the most unbounded, massive, cosmic ideas that humans have thought up yet: quantum physics. Black holes. Relativity. Euclidean quantum gravity. It’s been over half a century since he was diagnosed with the disease that famously put him in a wheelchair and forced an artificial voice upon him. But he never stopped working, releasing his most recent paper last July. I don’t know if he became a believer at the end, but I do know that he contributed more to a complete understanding of the cosmic mechanics of God’s creation than most people of the past century. That complete understanding is far from frivolous; and Hawking himself, though an atheist, explained why in the final lines of his 1988 book A Brief History of Time. That’s good theology. 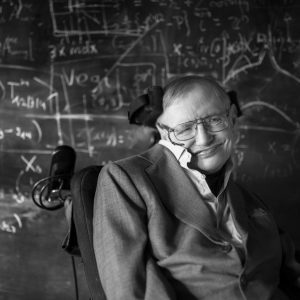 Hawking knew instinctively (and probably mathematically) that learning about the creation teaches us about the Creator– even though he didn’t believe in a Creator. But he also knew that it had to be something easily understood by ordinary people. The existence of God isn’t the only thing Paul says is obvious to humans – His attributes are, too; easily seen in creation. God revealed Himself to us through the created world; and, whether Hawking knew it or not, He was working for God in revealing both its minutiae and mass. To all of us. “The heavens declare the glory of God,” Psalm 19:1 famously says; seeing the work He did so effortlessly, the opulence He poured into the works of incredible art swept across our sky and land. We see God and understand Him better, even as our mind boggles at the equations and mathematics required to really comprehend those theories. So he should have that knocked out over lunch, right? The funny thing is, a lot of people think that means he also needed to declare war on religion and on Jesus in his quest; that the scientific pursuit is inherently anti-Christian. I contend that the opposite is true: that one of the most important and God-glorifying works one can pursue is a scientific pursuit of His creation in the world. This is the way God commands us to seek after Him. God invites us – even commands us – to test Him and His goodness. To observe, to build confidence in who He is and what He does. If He doesn’t measure up, if your observation ever disagrees that He is good, then you have to abandon or modify the theory. But He always measures up. Science is God’s way of revealing Himself to us through creation. From the day He commanded the first man and woman to be biologists, cataloging the species of animals all around them; to today, where He reveals new pieces of Himself to men and women around the world, even those who don’t believe in Him. He has always measured up. Stephen Hawking was one of those men; always looking for more. Maybe he saw Jesus for who He is. Either way, I thank him for his contribution to our world. May you find answers, Professor Hawking. Thank you for reading Redeeming Culture. This entry was posted in Science and tagged astronomy, cosmos, physics, quantum physics, science, stars, Stephen Hawking. Bookmark the permalink.